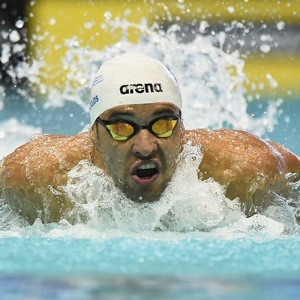 Cape Town - Chad le Clos (RSA) and Sarah Sjostrom (SWE) collected winners’ cheques for $150 000 as they were crowned series champions at the Fina/airweave Swimming World Cup in Singapore, on Sunday. According to FINA's official website, Sjostrom’s winnings were topped up by $50 000 as she additionally won the final cluster, which also called at Beijing and Tokyo. Both entered Sunday’s finals session at OCBC Aquatic Centre as champions, after their closest pursuers - and deposed title-holders - Vladimir Morozov (RUS) and Katinka Hosszu (HUN) were unable to gain enough points in the morning’s heats to extend the battle into the evening. The runners-up were, however, $100 000 richer after their season’s efforts, while third-placed duo Kirill Prigoda (RUS) and Ranomi Kromowidjojo (NED) picked up $50 000. Morozov collected $50 000 as men’s cluster winner. In last year’s overall series standings, only the winners were rewarded, getting $100 000. However, Fina announced a prize-money increase in September to cover the top three. This was also extended to the clusters, where financial rewards now go all the way down to $3 000 for eighth spot. The Chad ’n’ Vlad show got the night under way in the 100m free, the Russian winning the duel in 45.56, and Le Clos touching home second in 46 dead. When Morozov (23.85) finished sixth and 1.03 sec behind Pavel Sankovich (BLR), it left Le Clos needing to swim 48.25 in the individual finale, the 100m fly, to win the cluster. However, he only just held on for victory in 49.49, as runner-up Zhuhao Li (CHN) set a world junior best of 49.53. “This year was the best World Cup, not just because I won but because it gave everyone a fair chance with the rule change to the number of races, and some of the things Fina laid on for fans. If they can just keep on improving it and making it more exciting, that’s the key,” said Le Clos. Sjostrom celebrated her coronation in style, landing double gold in the 50m fly and 200m free, but doesn’t have any big spending plans for the $200 000. “It’s quite expensive to live in Stockholm, so when you buy an apartment that’s where all the money goes, so you have to save money - and you never know when you’ve earned your last prize money. You could get a shoulder injury or anything, so you have to take care of the money you win,” said Sjostrom. Morozov was delighted with his year’s work and welcomed some rumoured potential changes to the 2018 format. “It’s been a very successful World Cup, thank you to Fina for such an opportunity. I heard that next year we’ll be able to do six events, but only four of them will count, which I think is better. With that rule you give an opportunity to Katinka Hosszu and those others who swim a lot of events, so it’s more of an even competition for those kind of athletes,” said Morozov. Emily Seebohm (AUS) chased home Alia Atkinson (JAM) in the 50m breast as she started her pursuit of third-placed Kromowidjojo in the overall standings, but not even victory in the 100m back, (52.23) just 0.10 ahead of Regan Smith (USA), was enough to overhaul the Dutch speedster, who also denied her third place in the cluster. Hosszu was runner-up. Like Sjostrom, Kromowidjojo doesn’t have any grand spending plans just yet.